Transferring contacts from Android phone to Windows phone or from iPhone to Microsoft Windows phone can be a super easy task for you if you know the appropriate way to transfer contacts from one phone to another. 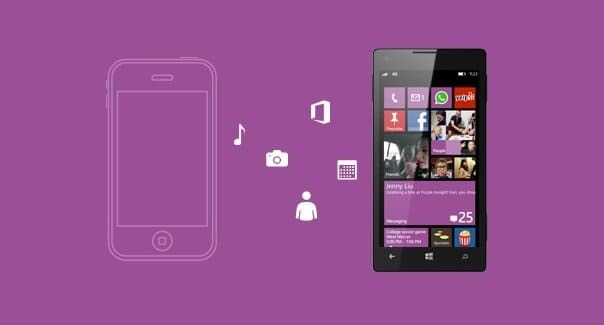 I am a huge fan of Microsoft smartphone. So whenever I purchase new Windows mobile phones then I always prefer to transfer contacts from iPhone or android to Windows phone using Bluetooth. And in the case of transferring contacts from Android smartphone to Windows mobile phone using Bluetooth, Transfer my Data is one of the most appropriate solutions. Basically, Transfer my Data is a well-known Windows phone app that allows you to copy contacts from almost any mobile phone (Symbian, Android, iOS, BlackBerry, Windows Phone and others) to your new Microsoft Windows Phone using Bluetooth. Addition to transferring contacts, it also helps you to transfer text messages and pictures from some selected mobile phone to Windows mobile phone. Before proceeding to follow the below-mentioned step by step tutorial, please keep in mind that this “Transfer contacts from android to windows phone using Bluetooth” guide is only applicable for only Microsoft Lumia Windows Phone. It will not work with other windows phone series like HTC, Huawei Ascend, or Samsung ATIV S mobile phones. Step (1): First of all, Install Transfer my Data Windows phone app from the Windows phone store on your Microsoft windows phone. 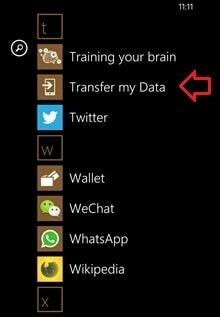 Step (2): Once the installation completes, launch the Transfer my Data app on your Windows smartphone. Step (3): Turn on the Bluetooth on both smartphones (Android phone and Windows Phone) and then pair them together. 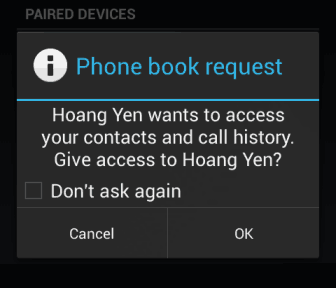 Step (4): Once the both mobile phones are paired successfully, you will be able to see a new Phone book request message on the Android phone. You have to press the OK button to allow the access. Step (5): Now on your Windows mobile phone, the app will show you the number of contacts that it can find on the android phone. So, now press the Start button which is located at the bottom of the app. Step (6): Just after the click, you will be redirected to the process page (copying) which displays you the time remaining and how many contacts have been transferred from the android phone to your new windows phone. Step (7): Once the copying process is done, you will be able to see a success message like “Great! your content has been copied from your old phone to your new phone“. Now, simply press the Finish button to exit. Step (8): Congratulations! 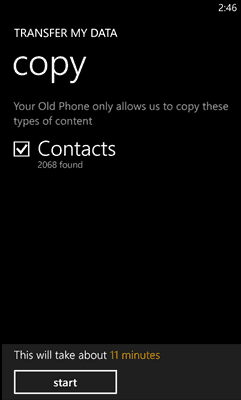 you have successfully transferred all contacts from android phone to Windows phone. Now, start accessing all your copied contacts according to your wish. 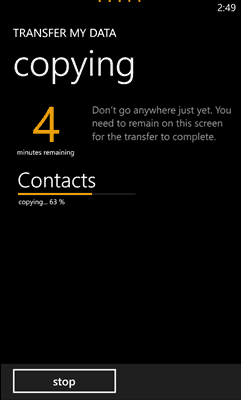 Thus, you can see how simple is to transfer contacts from android to windows phone using Transfer my Data Windows phone app. Try out above explained steps in order to switch contacts from Android smartphone to Windows mobile phone and share your view with us through comments. Please let us know if you are using any other Contacts Transfer app or methods to transfer contacts between Android phones and Windows Phones.